Another runner died in 2011: a 32-year-old man who died of cardiac arrest. 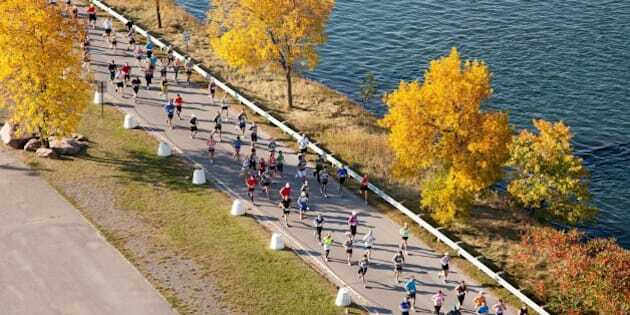 MONTREAL — A 34-year-old woman has died after collapsing during the 25th edition of the Montreal marathon Sunday morning. The woman, who was American, suffered a cardiac arrest midway through the race, according to medical officials. Paramedics were unable to revive the woman, who was treated on site and then transported to a hospital. About 20 people required medical care during the race and 16 were hospitalized. A second runner, a man in his late 40s, also collapsed near the finish line after suffering cardiac arrest. He was taken to hospital where he is in critical condition. Another death occurred at the same event in 2011, a 32-year-old man who also died of cardiac arrest. About 35,000 runners from 53 countries were scheduled to take part in the event. The race was won by Quebecer Nicholas Berrouard in a time of 2 hours, 26 minutes and 42 seconds. Genevieve Asselin Demers was the first woman to cross the line.